Each year, the QRCA (Qualitative Research Consultants Association) holds a contest for its members to respond to a fictional RFP. I joined the QRCA in late 2018 and was unaware of the contest until the finalists presented their proposals at the January 2019 QRCA conference (which were all excellent!). At the conference, I met several market researchers who were curious about the types of research I conduct as a UX researcher (beyond usability testing). To help answer that question, here is how I may have responded to the fictional RFP. The Qually Studio needs your help. Through data analysis, they’ve uncovered a potential opportunity for growth among a core segment of their customer base. Basically, the people who visit the gym the MOST are purchasing from their retail store the LEAST. The quantitative segmentation study results showed that the Gym Rats visit the Qually Studio 7X more often than the ImaGYMers, yet the ImaGYMers spend twice as much money over the course of 12 months. 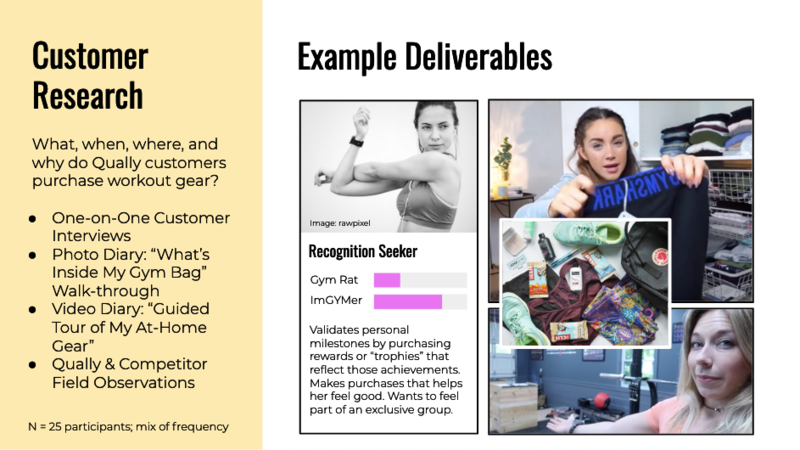 Learn the differences between the Gym Rats and the ImaGYMers that influence how they spend their dollars at The Qually Studio. Optimize the retail experience by uncovering the pain points (including uncovering key products to start carrying and stop stocking). Develop retention strategies for long-term retail store financial success. What are the Gym Rats’ perceptions of both The Qually Studio and the products they carry? What products are purchased to support the Gym Rats’ gym workouts? What is the motivation for purchasing from The Qually Studio versus somewhere else for both the Gym Rats and the ImaGYMers? Gym Rats: Visit the gym practically every day (on average 20-30 times each month), have auto-renewable annual memberships and enjoy the physical aspect of working out along with the social atmosphere. They make up 35% of the total gym population. ImaGYMers: Visit the gym only 3-4 times per month with unknown additional physical activity stats. They pay drop in rates rather than memberships and are typically more affluent. Most appreciate the community atmosphere (when they visit it’s often for classes versus independent workouts). It’s estimated they make up about 25% of the total gym population and are more likely to be women. 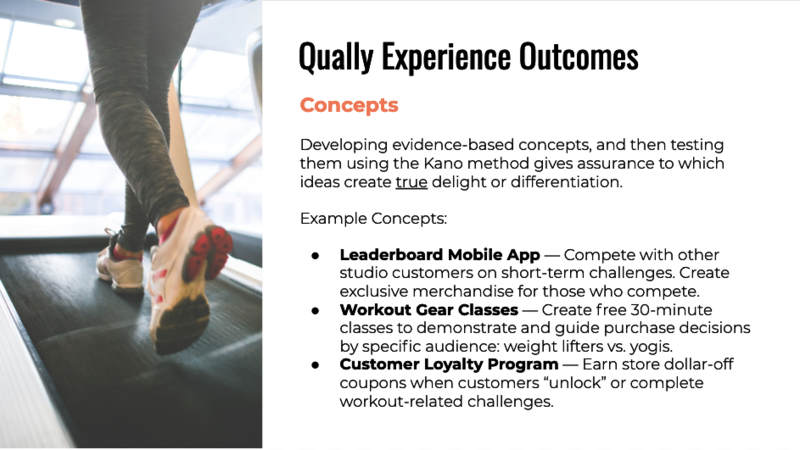 We recommend expanding the scope of research beyond your 2 main target audiences, Gym Rats and ImGYMers, and instead identify primary purchase drivers (i.e., user scenarios) for all customers. We believe this alternative approach will allow Qually Studio to capture a greater share of their wallet as well as open up many more avenues to creative thinking and exploration. 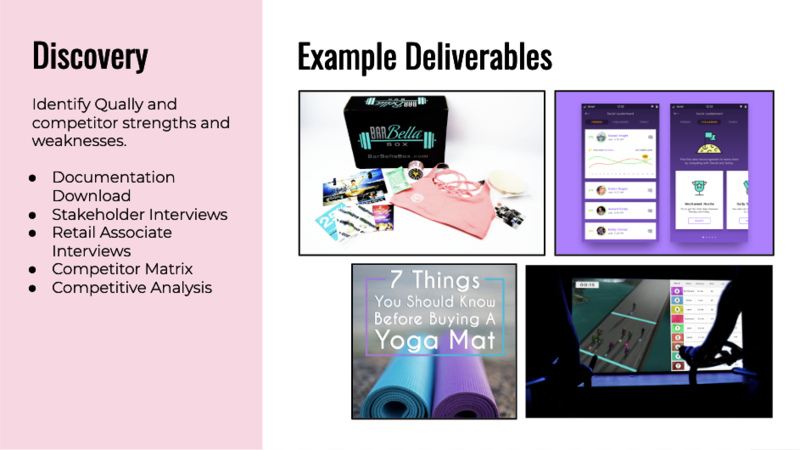 This alternate approach will also help us identify additional sources of revenue beyond gym memberships, retail, and classes—such as in-home gym consultations, subscription services, private access to instructors, fitness vacations, or online courses. June UX uses a highly collaborative approach to research. Our goal is to take you on this adventure with us, so that you can hear and see everything firsthand. Key stakeholders will be involved in all customer research sessions. Sessions will be recorded, too. June UX recommends a 3-part research study to deliver actionable insights, and we estimate the project will take 4-5 months to complete. Learnings will be shared with the Qually team throughout the project, to enable the team to act on quick wins as they’re identified. This proposal assumes that Qually Studio will provide access to customer databases for recruiting purposes. User personas are not pre-determined prior to the research. Instead, user personas will be revealed through the analysis. 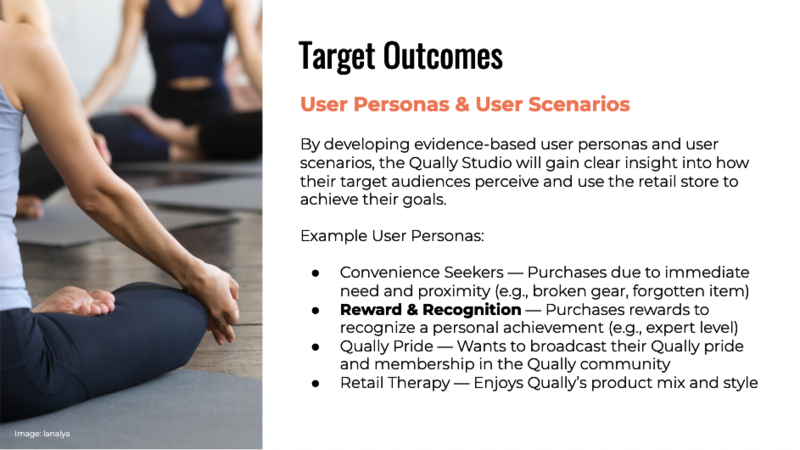 In addition, we will learn whether specific user personas are shared by one or both buyer personas (i.e., Gym Rats, ImGYMers). During the field research phase, it is important that participants are not given arbitrary tasks to complete. We’re less interested in their preferences and opinions, and instead, we want to reveal purchase motivations. By conducting the research in this way, we will be able to identify the “jobs” that customers are asking the retail store to do for them. For example, we may uncover that customers purchase rewards for themselves to recognize an important achievement or personal milestone. This insight opens up many more creative ways to integrate this use case into email marketing programs, social media campaigns, customer loyalty programs, on-site competitions, and so on. Specifically, Qually yoga instructors know their students take pride when they master a particularly difficult pose—products and marketing campaigns could then be built around this insight. 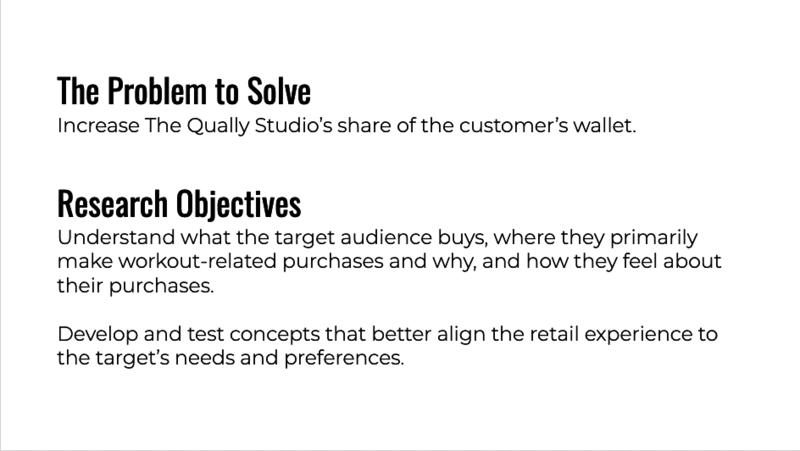 In developing concepts, we will consider all the ways Qually Studio could drive additional revenue and loyalty—not just through the retail store. Concept boards typically include an illustration of the idea as well as a brief description. Documentation Download — Gather research to-date, personas, retail store analytics, etc. Stakeholder Interviews — Gather known problems, hypotheses, and research questions. Retail Associate Interviews — Gather recon about buyer behaviors. Competitor Matrix — Create a matrix that identifies best practices and unique features or tactics. Competitive Analysis — Gather recon about competitor retail environments, foot traffic, website, marketing strategies, etc. 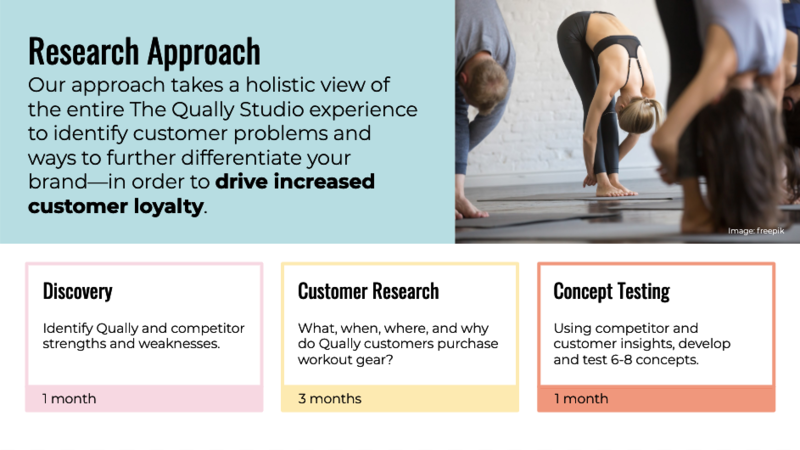 One-on-One Customer Interviews — Understand Qually customers’ past purchase behaviors and experiences, preferences, purchase motivations, why and when they shop in a Qually store, frustrations / pain points / barriers, etc. Photo Diary — During the IDIs, ask participants to tell the story behind each item in their gym bag (e.g., usage, source, feelings). Take an Instagram-style photo of each bag’s contents as research artifacts. Print photos in a photobook along with their stories as inspiration for the Qually merchandising team. Video Diary — Ask participants to submit a narrated video tour of their workout gear at home (e.g., usage, source, feelings). Field Observations — Observe shopper behaviors in Qually and competitor stores; what are the traffic patterns, what draws their eye / what gets ignored, what types of things are they buying, what are they putting back, what questions do they consider as they make decisions? Concept Design Workshops — During this all-day hands-on workshop, 8-10 of Qually’s most creative team members and 1-2 decision-makers will talk through the insights gathered, prioritize what problems the team wants to solve, and then design 6-8 concepts to test. 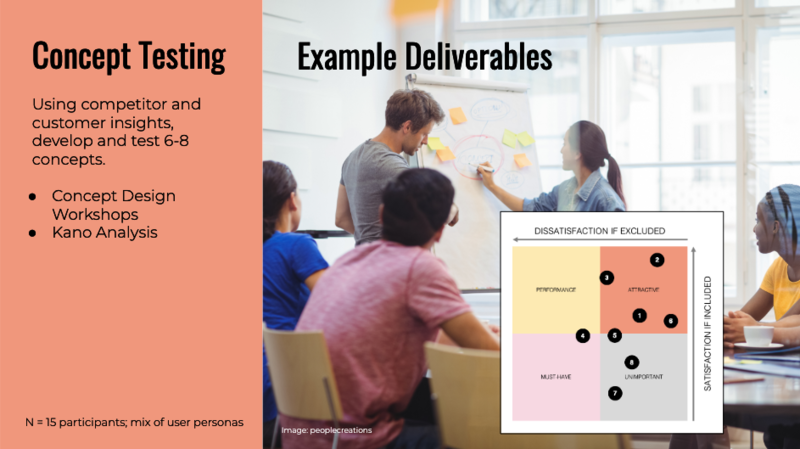 Kano Analysis — In each 1-hour session, participants will review and critique concepts, and then rate them per the Kano method. In Kano analysis, concepts will be plotted on a matrix that communicates which concepts are delighters vs. undesired.